Our most popular course: learn quickly & effectively! Rates: $175 - $275 p/week, $9.25 - $13.75 p/hour. Group 4 Course Format: 4 hours of group lessons each day. Maximum of 6 students per class. Group 4 PLUS: an even more intense & personalized course. Add extra hours of private lessons every day. Class Schedule: group Spanish classes are held from Monday to Friday between 8 am - 12 pm, with a 20 minute break after the first two sessions (55 minute sessions) or between 1:00 p.m. and 5:00 p.m. (in Panama City we start and end an hour later). Start Dates: beginner groups start on almost every Monday throughout the year. Students who already know some Spanish can start on ANY MONDAY throughout the year. You can study at any of our Spanish Schools in Panama or split your Spanish Program between locations without any academic loss in a Traveling Classroom by spending several weeks at each of our campuses, allowing you to experience Panama's beaches (Habla Bocas del Toro), mountains (Habla Ya Boquete), and the City (Habla Ya Panama City). Course prices are the same for each school location (the longer your program, you'll get a lower rate per week). 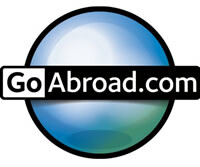 You can also obtain college credit when you join our Group 4 Spanish Course. Our Group 4 PLUS 2 Course is Bildungsurlaub approved for all levels. Group 4 is the most popular Spanish course offered at Habla Ya Panama Spanish Schools and is comprised of 20 hours of group Spanish lessons per week with the option of taking additional private Spanish classes. Students have 4 hours of group Spanish classes each day either in the morning or in the afternoon (schedule varies according to school location). There is a maximum of 6 students per class, although the average amount of students in the classroom is usually between 3 and 4. As groups are small, students always receive the personalized attention required to learn Spanish. Groups are arranged according to students' Spanish levels ensuring that classmates will have a very similar degree of communicative proficiency. If you know some Spanish, even a small amount, you're required to fill out our Online Placement Test before starting your language course. Upon arrival, students also have a short oral interview with one of our teachers to confirm each student's exact Spanish level. In this way student's oral expression and listening comprehension skills are taken into account as well as their reading and writing skills. If there aren't other students of your same level (which is unlikely to happen) and you have signed up to have group lessons, you'll have a teacher all for yourself, for the same 4 hours - as long as we have teachers available - although your schedule might change. If you can't have the same amount of hours, a refund or credit will be granted. If for any reason you would like to limit your class size to two or three students (couples or groups of friends traveling together), you can sign up for Mini Group lessons instead. For those seeking a more intensive Spanish course or an even more personalized or specialized one, the Group 4 PLUS Spanish Course adds 1 or 2 extra hours of Private Spanish classes per day to the standard 4 hours of Spanish classes in group that students normally have each day. In these extra hours you'll be able to focus on whatever you want to. For example, you can keep working on your conversational Spanish skills, on a certain area that is more challenging for you, talk about the Latin American culture and politics, or simply focus on certain difficult grammar topics. You can also take this time to prepare for the DELE exam, study Medical Spanish, Legal Spanish, Spanish for Teachers or Spanish for Business. Moving faster through our level system by taking 5 or 10 extra hours of private lessons per week isn't necessarily the goal as the group lessons will follow their own pace, but if you do make significant progress, you can skip weeks if your teacher finds it will be beneficial for you and your classmates. Group 4 PLUS 1 adds 1 extra hour of private Spanish classes to the 4 standard hours of Spanish group lessons that students normally have each day and Group 4 PLUS 2 adds 2 extra hours of private Spanish lessons. Private lessons are 1 on 1: just the teacher with one student. Group Spanish classes in Bocas del Toro are mostly held from Monday to Friday, between 8:00 a.m. and 12:00 p.m., with a 20 minute break after the first two sessions (55 minute sessions). 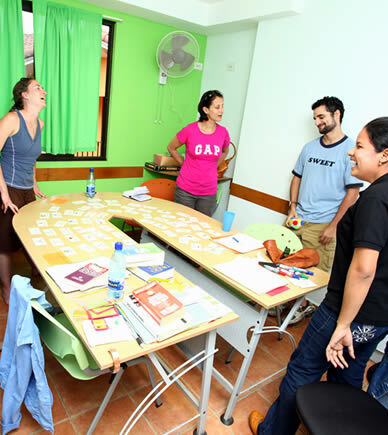 In Boquete, group lessons are normally scheduled between 1:00 p.m. and 5:00 p.m.
And in Panama City between 2 p.m. and 6 p.m.
During the rainy season in Boquete and in Panama City, it's more likely to rain in the afternoons, and this is why we tend to schedule Spanish lessons in the afternoons so that students can enjoy outdoor activities during the mornings. In Bocas del Toro it's the opposite: during the rainy season it's more probable to rain in the mornings and this is why the schedule in Bocas is the other way around. Time slots will be assigned according to teacher availability. During high season (January - March, June - August), as our schools get quite full, schedules are arranged according to what's possible. For those students who sign up for our Group 4 PLUS Spanish course we schedule their additional private Spanish lessons to take place during the other half of the day in which they are not having their group classes. For example, if a student is having group lessons in the afternoon, then his or her extra private Spanish lessons can take place between 8:00 a.m. and 9:50 a.m. or between 10:10 a.m. and 12:00 p.m. The schedule for group lessons also depends on each student's Spanish level. During certain times of the year, groups for specific levels may only be available during the mornings or during the afternoons. Students will be emailed their final schedule during the week prior to their arrival. When considering how many weeks to sign up for, take into account that each of our first three levels (A1, A2, B1) can be completed in an average of 60 hours of lessons each (3 weeks each when having 20 hours of lessons per week), our fourth and fifth levels (B2, C1) in 100 hours each (5 weeks), and our sixth level (C2) in an average of 400 hours more (to be just like a native). We will always make a professional suggestion based on your Spanish level, on how far you want to advance and on how fast you want to get there. To see what you'll be able to do upon completing each level you can visit our level system section. When you join a Spanish Immersion Program (Spanish Course + Family Home Stay) you usually make progress 10 to 25% faster. Spanish lessons in small groups! Max of 6 students p/class with us... Contact us! If you really want learn Spanish in the shortest timeframe possible being part of a dynamic, exciting and challenging environment, our Group 4 Spanish Course is the right one for you and can take you through all our Spanish levels. Not everything is about studying... have fun with us! If you want to make friends, dance, party, relax, learn more about the Panamanian culture, socialize, or just have fun, join us after classes! There is nothing more effective to learn Spanish than having native friends who speak Spanish. Share a meal at a local restaurant in town, have a beer in one of Boquete's, Panama City's or Bocas del Toro's bars, go dancing or play poker during the weekend, watch movies together, play soccer or ultimate frisbee or just hang out, and that will give you all the practice you need... and we will help you make it happen! You should realize that the social and cultural activities organized at Habla Ya respond to the way people learn languages: classes are not enough, you need to practice, so we encourage you to use all the tools you have at hand. Enjoy the learning process: have fun! It is much easier to learn if you're having the time of your life. Consider all the extra activities we have: on their own they are worth it, so why would you not use them to learn faster? And besides, they'll make your vacation in Latin America an unforgettable one.